The most recent storms have pushed damages in the County to more than $30 million in damage to our local roads and infrastructure, causing some of the most significant challenges in recent memory. The Board of Supervisors declared a third emergency in as many months and has submitted requests to the state and federal government for funding. 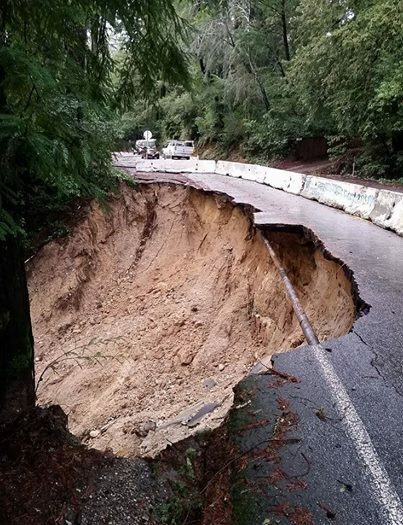 Many roads have sustained damage and have caused major impacts – including Valencia, Bear Creek, Glenwood, Zayante, Soquel-San Jose roads and Smith Grade. Governor Brown approved the declaration for the January storm events and has requested assistance through the Federal Highway Administration’s (FHWA) Emergency Relief Program, which could provide additional funding for the Federal Aid Routes (major arterials and collectors) in Santa Cruz County. Under the current funding approvals, this would mean that more funding would be available for roads deemed “federal aid routes” (usually major roads such as Valencia, Zayante, Soquel-San Jose, Bear Creek) than local roads. The state disaster funding provides coverage (usually up to 75 percent) for the cost of repairs. However, the Governor did not make these funds available for the December storm damage. We are working with our state and federal legislative delegations for funding for damages sustained in December as well. Then, on Feb. 14, President Trump followed up with a major disaster declaration for the state, including Santa Cruz County, triggering the release of Federal funds to help communities recover for damage that occurred from January 3 to 12. The FEMA funding is available for public facilities and roads, including utilities, centers and others that provide essential governmental services. I am very disappointed that the many private roads and private properties that have been damaged are not available for FEMA recovery funds under the President’s declaration. Our already fragile mountain roads have taken a beating, as they were used by commuters and commercial traffic as an alternative to Highway 17. We will continue to work with our federal representatives to get assistance for private property. I am keenly aware of the issues that the recent storm damage has caused throughout our County. They are real and very problematic. In some areas of our district we had days where people were completely cut off from their home as slides had eliminated access or flooding prevented all ability to travel sections of our district. With the emergency declaration providing up to 75 percent of the funding needed for certain roads, this leaves a multi-million-dollar gap of funding for repairs (even just focusing on top priority repairs) associated with the recent storms. As many of you are aware, just by looking at the condition of our local roads in general, Public Works doesn’t have a few million dollars extra for road repairs. Because of this reality, the Board of Supervisors is looking at the possibility of borrowing to address high priority roads (like Valencia and Bear Creek) that were damaged. Options could include the best use of transportation impact fees, Measure D funds, and Surface Transportation Block Grant funds. Taking out such a loan would most likely mean that other road work (such as planned capital improvements – road overlays, repairs etc.) that isn’t from storm damage might be delayed (in some cases significantly). However, we recognize that these storms have caused situations that must take priority over other road needs. If you have potholes that need attention, please use the Citizen Connect mobile app through the County or the Public Works page to report directly – http://www.dpw.co.santa-cruz.ca.us/ReportProblem.aspx – this helps us inventory them and work with Public Works and getting them filled. We recognize this is a difficult and frustrating situation and thank you for working with us as we try to address these very pressing needs caused from the recent storms.